Have you ever wondered why some leaders stand heads above the crowd? What their secrets are and why their staff, colleagues, students and peers revere them so much? 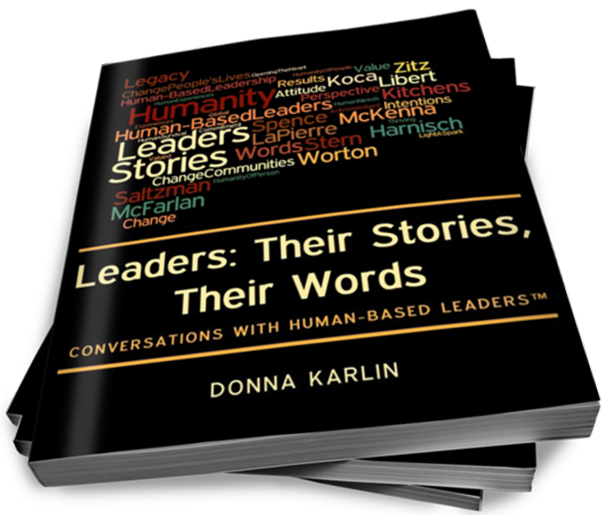 Leaders: Their Stories, Their Words is an anthology of one-on-one conversations held between Donna Karlin, global executive and leadership coach, and the different leaders she invited to tell their stories. Each leader was encouraged to share their personal history reflecting their transformative experiences. The stories of their amazing journeys de-mystify the experiences of seasoned and successful leaders. Donna identified leaders across a broad range of professional disciplines (from politics and business to medicine and education). Each one has produced exemplary results. Each uses a style Donna characterizes as human-based leadership. Human-based leaders operate with respect and appreciation for their people. Their teams deliver because they are encouraged and inspired to be their best. This contrasts with a more common form of leading – power-based leadership – where people are used as an instrumental means to organizational ends. Each leader’s story is different. Each story describes difficult, character-building experiences that echo the kinds of challenges many of us may have faced. John Spence, a global business advisor, used a failed college experience and wise advice from a professor to turn his professional life around. Joe Saltzman, award-winning broadcast journalist and professor, leveraged mentoring from his high school teacher to set course towards a journalistic career. Ruth Ann Harnisch, enlightened philanthropist, drew on wisdom from a teacher and the simple lessons from a childhood board game to develop her philosophical approach to giving. Ron Worton, award-winning geneticist, used his commitment to excellence and collaboration to create teams and organizations that conducted breakthrough medical research. Frank McKenna, businessman and former politician, used his humble background as the persistent burning platform to achieve ambitious goals for his organization and the country at large. Leaders: Their Stories, Their Words challenges us to learn more about what’s important to us – how we can engage and express our values more powerfully. My guest today is Donna Karlin, a pioneer in the field of leadership coaching. Welcome to OpEdNews, Donna. Leaders: Their Stories, Their Words, Conversations with Human-Based Leaders is now available!